This second floor, two-bedroom plus den, two-and-a-half bath residence has a warmth and charm you will feel the moment you step in the door. The open kitchen, with upgraded granite countertops, flows right into dining area and the comfortably furnished living room, an inviting spot after a full day on the slopes. Large windows fill the space with natural light, accented with hardwood floors. The deck off the living room has a table and chairs, making it the perfect spot to take in the creek views enjoyed throughout the home. The master suite off one side of the living room is furnished with a king-sized bed and en suite. The second bedroom sits on the other side of the home has two twin-sized beds, an adjoining bathroom and private deck. The den off the dining area is furnished with an armoire and comfortable couch that pulls out to a Queen providing an additional sleeping area. 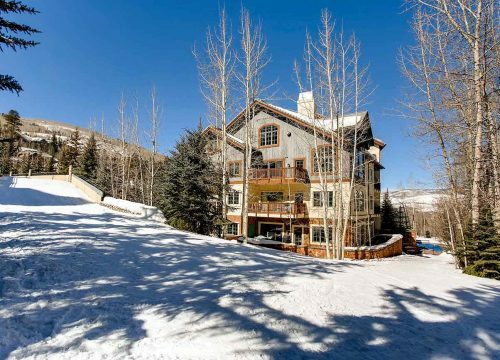 Guests enjoy a year-round, outdoor pool and relaxing hot tub overlooking the actual Beaver Creek , and a fitness center sits just inside near the ski locker room. The Beaver Creek Village is also within walking distance of the Oxford, and guests can enjoy the skating rink, shops and restaurants and all the activities of the Resort.